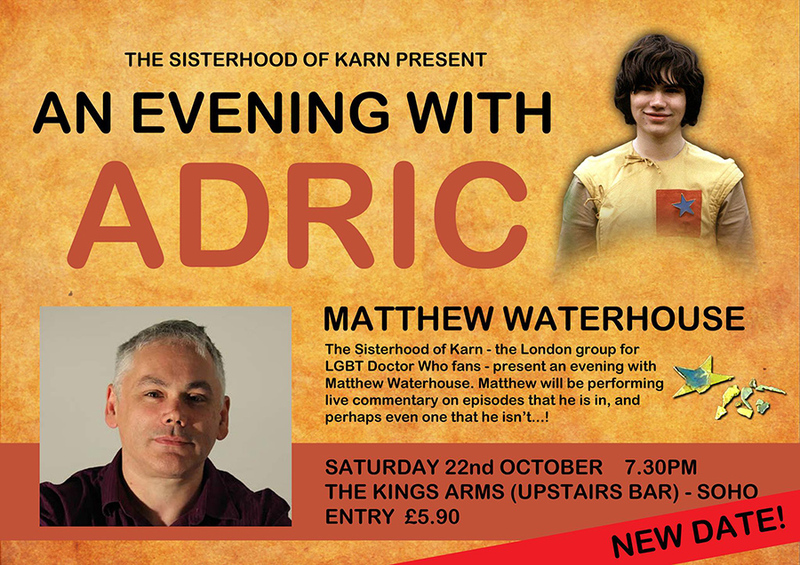 The Sisterhood of Karn - the London-based social group for LGBT Doctor Who fans - present ‘An Evening With Adric’. Companion actor Matthew Waterhouse, who played Adric alongside the fourth and fifth Doctors, will be joining the Sisterhood Of Karn as a special guest for the evening. Matthew will be performing live commentary on episodes that he is in, and perhaps even on one that he isn't...! He will also be signing copies of his books, which will be available to purchase at the event. Event: Tom Baker's 'The Boy Who Kicked Pigs' Gets London Theatre DebutFollowing a critically acclaimed run at Salford’s The Lowry Theatre in May 2012, Kill The Beast Thea...Alien Of London: Issue 5 - [August 2018]In the latest entry of Alien Of London, Richard discusses the LGBT Doctor Who fan group, The Sisterh...Event: Doctor Who 50th Anniversary Celebration At ExCel This NovemberBBC Worldwide announces The Doctor Who 50th Anniversary Celebration at London's Excel in November.